FANUC Oceania supplies Factory Automation and CNC Control systems to local Machine Tool Builders and Retrofitters who specialise in rebuilding and retrofitting machines and extending their life or changing their function.. For more information, please Contact Us. 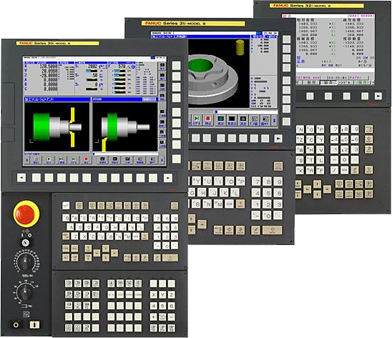 The FANUC 0i Model D and 0i Mate Model D CNC Control is the worlds most popular CNC control system. They are highly reliable control systems ideal for standard type machines such as lathes and machining centres. They feature a wide variety of combinations from the low cost 0iMate D to the 2 path capable 0iT Model D. This control is ideal for retrofitting and will extend the life of your machine by many years. The FANUC 30i Model B series of controls are controls systems designed for more complex machine configerations such as multi axis and multi path machines. They can drive up to 32 servo axes and can feature full 5 axis similtaneous machining depending on the configeration. The 35i Model B is designed for transfer lines and Powermotion applications. The FANUC Powermotion i Model A is a motion control designed for general industrial machines such as presses, stamping machines, filling machines, winding machines, etc. This control is capable of driving up to 32 servo axes. Your FANUC Control is capable of more than it was originally set up to do. Many additional features can be enabled, for example helical intepolation, larger program storage memory, additional work co-ordinate pairs and many others. Contact us to find out what you control is capable of.